Our product range includes a wide range of basin cooling tower, frp natural draft cooling tower, frp square type cooling tower, round shape cooling tower, water cooling towers and cooling towers. 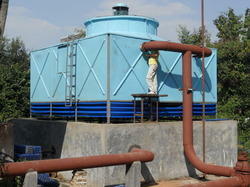 Since our inception, we are broadly instrumental in offering superior quality Basin Cooling Tower. Backed by our years of experience in this industry, we are engaged in offering an exclusive range of FRP Natural Draft Cooling Tower. 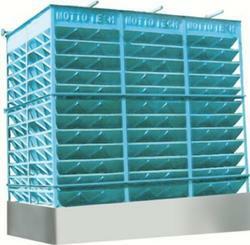 The offered cooling tower is widely appreciated in the market for its optimum performance. Our quality inspectors test this product under strict quality measures to ensure a flawless range. Our product can be modified according to specifications laid down by our clients. Moreover, the product we offer is made available to the clients at affordable prices. 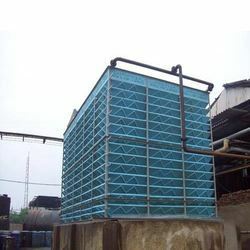 Empowered by our in-depth experience and dexterous workmanship, we have acquired our customer’s appreciation for supplying qualitative FRP Square Type Cooling Tower. In order to deliver defect free range at customers end, this product is thoroughly checked on well-defined parameters post manufacturing procedure. The offered product is manufactured using top class quality raw materials under the rigid surveillance of our experts. It is made available to our valuable clients at the most affordable price. 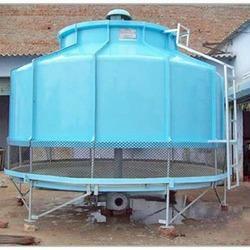 Round Shape Cooling Towers are used in all type of industries to cool. Round Shape will give very good appearance. The rotary sprinkler gives uniform water flow over the wet deck fills and gives maximum cooling efficiency. By keeping in tune with the current market development, we are supplying our clients an excellent quality Water Cooling Towers. It is manufactured by using supreme quality raw materials and cutting-edge technology as per the set industry norms. The offered product is highly praised for its rigid construction and durability. Our product comes in various specifications to suit our client's requirements. We provide the offered product to our clients within the estimated delivery time. 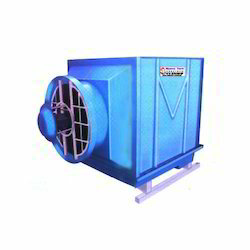 Since our inception, we are broadly instrumental in offering superior quality Cooling Tower. The offered cooling tower is manufactured using contemporary machines and fine quality raw material in adherence to set industrial norms. 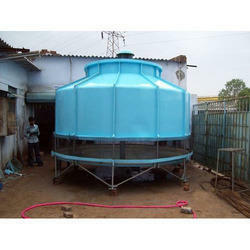 Further, we offer this basin round tower in with various specifications laid down by our valuable clients. Moreover, our prestigious customers can avail this tower from us at an affordable rate. 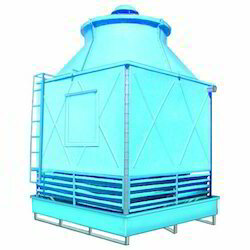 With immense industrial experience and expertise, we are offering a wide range of Single Cell FRP Cooling Tower. These cooling towers do not require fan and PVC fills. 100% guaranteed for NO power & maintenance. Special aerodynamic designed FRP louvers reduce spillage and evaporation loss. Hot Dip galvanized structural and S.S. fasteners increase the lifetime and efficiency of the tower. it can be installed for any range of cooling applications. Non clog nozzles easily for cleaning and very affordable price for keeping spare nozzles. The hot water from the heat source is circulated to the inlet header of the cooling tower. The inlet header rues have branches and sub-branches covering the internal area of the cooling towers. The clog nobles are connected to the outlets of the sub-branch ruing's. At an inlet pressure of i - 1.5 kg/cm' to the cooling tower, the hot waters are atomized to a mist state. The n.7,1p5 are self-designed to create more pressure thereby converting water into minute atomized particles. From the four sides of the louvers, plenty of fresh air is automatically circulated by the aerodynamic designed FRP louvers. Waters are directed by the special aerodynamic louvers towards the collection sump. The louvers ensure that the water does not spill out of the towers. The hot waters, that are in a mist state, comes directly into contact with the ambient tr and the cooling is achieved mainly by the portion of water, that gets converted to vapors, thus caring away the latent heat of evaporation. Fore, water gets cooled and in this process. 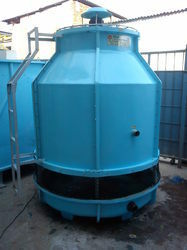 To net propelling demands of our clients, we are engaged in offering a wide range of FRP Cross Flow Cooling Tower. 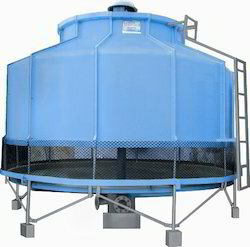 This cooling tower is designed for maximum service life and durable structure for an air-water long working period. It’s PVC perforated 'v' bar provides maximum wet surface air-water contact to give maximum performance in all seasons. This product is widely demanded in domestic as well as international market.